Who else is ready for Friday?! (I'm raising my hand). Actually, this week has been flying past me faster than I can catch up. So many posts to publish and so much to share while we are in the midst of the Nordstrom Anniversary Sale. If you didn't shop early access, get ready for the public sale to open up THIS FRIDAY at 12 am PST / 3 am EST! For today's post, I wanted to share some of my favorites from the sale styled in a way that you can start wearing now and into the beginning of fall... because don't we all want to start wearing our stuff now?! (nodding my head in agreement). You'll also find my favorite booties at amazing prices and in a vast array of colors - most are under $100 too! These western inspired booties have been all the rage this anniversary sale and luckily it looks like they stocked up! Right now they are available in four colors and most sizes - which I love because it means all of you have a chance to try them. I've noticed western styles are going to be very popular this season in shoes and clothing and bags. I ended up feeling just like Daisy Duke taking these pictures haha! For sizing: I have a very narrow/shallow foot and bought true to size (7). I also bought these really cool thin ankle socks that don't move to wear with so that I don't get blisters on my toes - and they fit perfectly! If you have a wider/more normal (lol) size foot you may want to think about going up a 1/2 size especially if you want to wear with a sock. 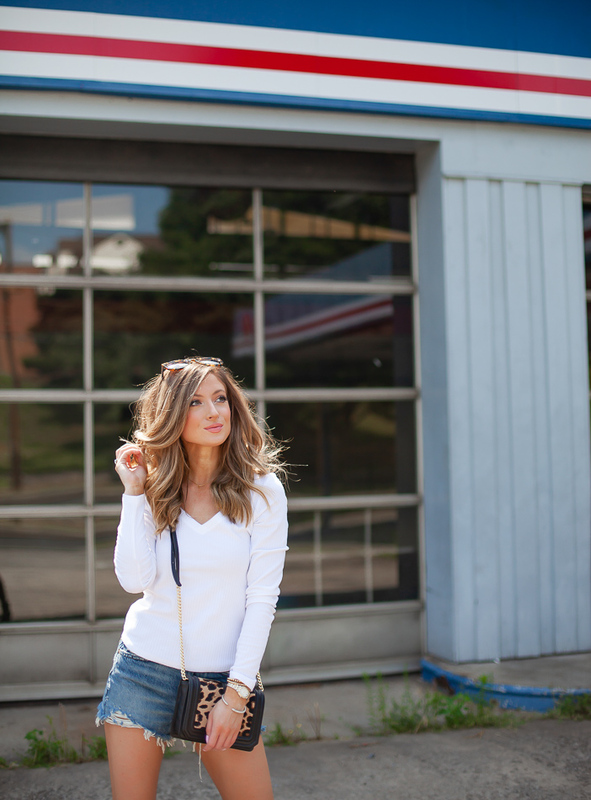 My white long sleeve ribbed tee is a sale must! I also bought it in black - so practical. It's the kind of top that is perfect to have on hand for transitional weather, even in the summer on a cool night. It's thick enough to not be see through but thin enough to be quite comfy. I definitely recommend snagging a few while they are still in stock. For sizing: I bought mine true to size (xs). 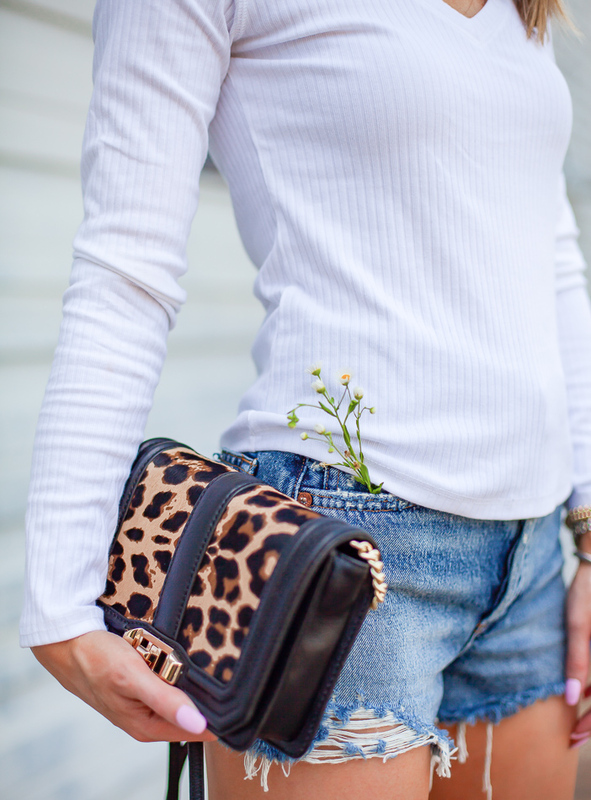 I also cannot say enough good things about this leopard crossbody bag! You all have heard me talk about it so much already but for good reason. I actually bought the exact same bag in olive last year and love the style and the size. It's big enough for the essentials and the adjustable strap makes it perfect for a variety of heights. I'm also a complete sucker for gold chain detailing, and of course, a leopard print (I bought quite a few sale items in leopard lol). This bag is a great way to add print and pizzazz to a neutral outfit or even for work if you have to keep your wardrobe conservative. It's small enough to fit in your tote to take out for lunch or errands! Below you'll find several more of my favorite sale booties and all of my posts from the Nordstrom Anniversary Sale so far. ALSO, DON'T FORGET TO ENTER TO WIN A $500 NORDSTROM GIFT CARD GIVEAWAY IN LAST FRIDAY'S BLOG POST. Enter HERE!